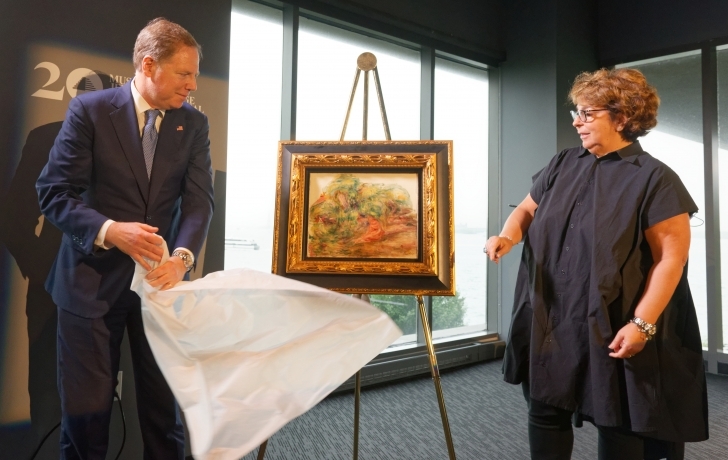 In an emotional ceremony at the Museum of Jewish Heritage on Wednesday, federal authorities returned a Renoir painting, looted by the Nazis in 1941, to its rightful owner. “I’m very thankful to be able to show my beloved family, wherever they are, that after all what they’ve have been through there is justice,” said Sylvie Sulitzer, 59, the granddaughter and only heir of a prominent Jewish art collector who fled Paris to escape the Gestapo at the start of the war. Sulitzer saw the painting, Deux Femmes Dans Un Jardin, for the first time when she unveiled it along with Geoffrey Berman, U.S. Attorney for the Southern District, whose office worked with the FBI to verify the painting’s ownership and secure its voluntary return. The museum will display the painting through Sunday, Sept. 16. Admission is free during that time. Deux Femmes Dans Un Jardin is one of Pierre-Auguste Renoir’s last works, painted in 1919, the year he died. Sulitzer’s grandfather, Alfred Weinberger, acquired the painting in 1925. He stored his Renoirs and other valuable paintings in the Morgan Bank before the family fled Nazi-held Paris for a town in the French Alps. Those paintings, seized in 1941, were among the massive number of works stolen and meticulously documented by the Nazis during the war. Following the war, the painting traveled the world, to art sales in Johannesburg, London and Zurich. Sulitzer became aware of it in 2013, 36 years after her grandfather’s death, when it was to be auctioned at Christie’s Gallery in New York City. An investigation by the FBI and U.S. Attorney’s Office led to proof that the painting belonged to her. Berman, the U.S. Attorney, would not speculate on the painting’s value. “Suffice it to say that Madame Sulitzer believes it is priceless,” he said.